Chinese Premier Li promised yet more stimulus measures overnight from tax cuts to focused rate reductions (but, he admitted, not blanket liquidity provision). 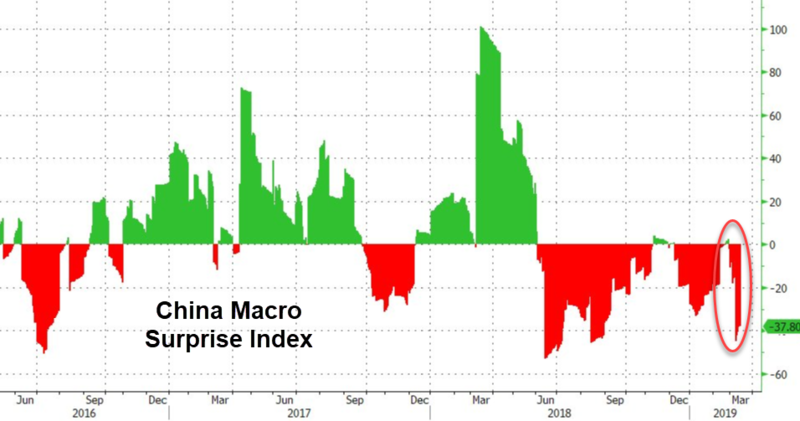 But, after over 60 different 'stimulus' measures in the last few months and last night's promises, nothing seems to be working as China's economic data continues to tumble. "There are reasons to be concerned [that easing is becoming less effective]. Local government officials who typically implement infrastructure spending and other forms of stimulus are facing conflicting pressures. The emphasis in recent years on reducing off-balance-sheet borrowing, selecting only higher-value projects, and eliminating corruption has made local officials more cautious. But at the same time, the authorities are now encouraging local officials to do more to support growth, like accelerate infrastructure projects. President Xi himself recently acknowledged the incentive problems and administrative burdens facing local officials." This “Chinese Equities rally effectively holding further RRR cuts hostage” then could become a serious “fly in the ointment” for near-term / tactical “reflation” (or bear-steepening) themes, as Q2 is on-pace to see a significant liquidity shortage.